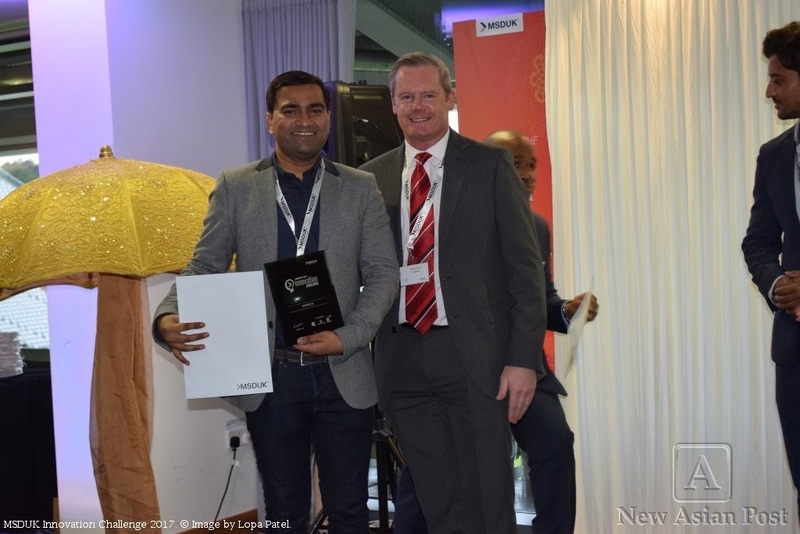 Amit Pate of Snaptivity, a smart stadium technology that drives fan engagement at live sporting events, won the MSDUK Innovation Challenge on 21st September 2017 in Birmingham. In a pitching contest organised at Edgbaston cricket ground, judges declared that Mr Pate’s platform had considerable opportunity to increase sponsorship revenue for event organisers and brands and was one of the start-up business most likely to scale on a global stage. The prize of a $10,000 week-long Executive Program at the Tuck Business School in Dartmouth, USA, will offer him an opportunity to research the potential market for Snaptivity in America and make business connections with potential partners. Runners-up for the MSDUK Innovation Challenge were Joyeeta Das, CEO and Founder of London based AI company Gyana and Syed Ahmed, the Founder and CEO at Savortex which manufactures smart hand dryers for washrooms. Both runners-up also receive a $10,000 week-long Executive Program at the Tuck Business School, sponsored by Cummins, EY & Bristol Myers Squibb. On accepting his prize Amit Pate stated: “It was great to be around such bright and innovative companies and I’m extremely honoured to be the winner of the Innovation Challenge. A wonderful day surrounded by full of inspiring businesses and successful entrepreneurs. Listening to their journey was very motivational and gave a great insight into what’s there waiting down the line. I think MSDUK once again proved that ethnic minorities are far from being a minority in the wealth of talent and business. I’m really looking forward to the executive program at Tuck Business School, where I’ll be able to learn best business practices and establish the network for Snaptivity to enter the market”. MSDUK Innovation Challenge pitch panel judges included Denis Ford, International Sourcing Leader, Cummins; Rondu Vincent, Global Supplier Diversity Director, Bristol Myers Squibb; Poppy Dowell, GCHQ Cyber Accelerator Programme Manager, Wayra UK; Ray Lambe, Director of Programme Delivery, Digital Catapult and Maria Harrison, Associate Director, Technology Sourcing, Ernst & Young. Shortlisted applicants were judged on the quality of the pitch, product knowledge, clarity of the marketing strategy, business plan viability and quality of responses to judges’ questions. The assessment panel which chose the final 10 finalists included Jamie Harrison of Digital Catapult; James Johnson of Cummins, Dale Turner of Skanksa; Sid Narang of TheSqua.re; Chaitanya Kumar of Swayam Group; Lopa Patel MBE of NewAsianPost.com; Sue Scott-Douglas of Barclaycard and Mayank Shah of MSDUK. Finalists were judged on the quality of the innovation, relevancy for the industry sector, marketing strategy, business plan and overall quality of a written submission, including all associated collateral and video materials provided. Applications were invited from a range of sectors including Healthcare, FinTech, Real-Estate and Property Tech, Sustainability (including environment, energy and conservation) and Technology (including Artificial Intelligence, Augmented Reality, Virtual Reality, IoT and Cyber Security). The Innovation Challenge was part of the MSDUK Business Show, the UK’s only business expo connecting ethnic minority businesses with corporate supply chains and featured 40 exhibitors and over 250 delegates. Amit Pate is a founder & CEO of Snaptivity. He is an experienced serial tech entrepreneur with rare ability to innovate and foster projects on a global scale; a great combination of tech approach and business thinking makes him stand out. He is also the recipient of Young Achiever of the Year award by British Indian Awards. He is a hacker by night and a die-hard cricket Fan. Snaptivity is a smart stadium technology that drives fan engagement and increases sponsorship revenue at live sporting events by capturing candid emotions and reactions of fans. It uses robotic cameras that are triggered automatically by AI and IoT sensors when fans bounce and cheer or sigh in disappointment. It is a content-generating engine; by capturing momentum, it allows brands & teams to conceive meaning to the sponsorship & reach people at scale in a targeted, emotional and personalised way. The innovative technology of Snaptivity is backed by DIT, UK and Creative England. In terms of achievement, Snaptivity was named as a Top 5 SportsTech start-up company by Sportel Monaco. In addition, it has signed a multi year partnership with Edgbaston Cricket Ground, Wembley Stadium, the home of English football, a few leading Premier League clubs and are pre-approved at 8 stadiums for the World Cup 2018. Joyeeta Das is the CEO and Founder of London based AI company Gyana. She is a TEDX speaker, an ambassador for Innovate UK women in innovation, a Top 100 Asian in UK Tech and an official representative in several international UK trade delegations. She is a high-energy, techie-entrepreneur who has built both non-profit and for-profit organisations from a young age. She believes in using technology to create a version of the world that is bigger, better and beautiful. She started her career as an engineer and later on, a program manager, in a Fortune 10 tech company and has a degree in Physics as well as Electronics Engineering. She has obtained an MBA from the Oxford University under the Said Scholarship Scheme and was also a Fellow at The Oxford Entrepreneurial Centre. Gyana is a cloud based platform that shows retailers what real-world factors drive their sales. By combining over 40 sources of global data, Gyana is able to reveal the impact that anything from weather, traffic, social media and events had on a company’s performance. The core AI technology integrates a company’s data with Gyana’s macro data to identify trends, rare data sets and correlations through a super-simple interactive UX. Syed Ahmed is the Founder and CEO at SavortexLtd, and a partner to the RBS Innovation Gateway. Syed was awarded Lloyds Banking Group, English Asian Entrepreneur of the Year 2015. Syed’s vision is that energy and waste cannot be reduced in commercial buildings unless pinpoint source data is collected from smart devices and converted into actionable intelligence. This enables informed decision making, cross-collaboration with suppliers, employees and stakeholders across multiple locations for profit boosting insights and transformational business models. As the visionary and strategist behind Savortex’s innovative product range, big data business model and transformational partnerships with sustainability focused multinationals such as Intel, Carillion plc and RBS. In that context, Savortex engineers have created game changing technology by combining British manufacturing, Innovation with IoT (internet of things) to produce a new paradigm of smart and revenue producing hand dryers, providing building intelligence, significantly reducing cost and waste in facilities, whilst improving hygiene, resource efficiency and boosting profitability. Under Syed’s leadership, Savortex has won numerous eco awards and been selected as one of the UK’s top 16 high growth cleantech companies backed by the UKTi. The company, which continues to grow, also receives funding from Innovate UK to bring innovative technology to market. MSDUK is the UK’s leading non-profit membership organisation driving inclusive procurement. It has played a leadership role in supplier diversity/inclusive procurement in the UK since its inception in 2006, working to encourage global and British companies to provide access to supply chain opportunities and engage with ethnic minority-owned businesses. MSDUK is part of a global network of similar organisations in Australia, Canada, China and South Africa – all affiliated with the National Minority Supplier Development Council, USA.